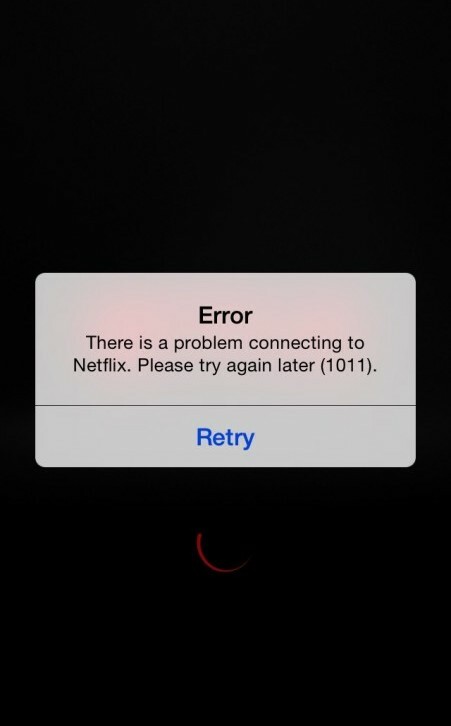 The Netflix error 1011 on the iPhone or other Apple devices is easy to fix. It is usually identified with the following message: There is a problem connecting to Netflix. Please try again later (1011). What Does The Netflix 1011 Error Mean? There is a problem with the internet connection on your iPhone. The Netflix account information on the iPhone is not correct. The Netflix app crashed temporarily. There is a problem with the Netflix cache on your device. There are several things you can do that would clear this error and stop it from showing up on the next try. These pointers or methods are listed below. These are not steps, these are options, you can try all of them though in the order they appear here with the last one being your last resort. Check to make sure the internet connection on your iPhone or iPad is okay by visiting a webpage from your browser. If your connection is good, then that probably wasn’t stopped Netflix. On to the next one. Go to your iPhone home screen, then click on Settings. Scroll down until you find Netflix, then click on it. Switch the Reset button to On, then go back to your home screen. Open up the Netflix app again, then enter your login details to sign in. Now try streaming again to see if the error 1011 would reappear. It shouldn’t. It is a known fact that restarting a device clears some small surprisingly difficult to fix mobile problems, which is sometimes or even more commonly caused by an overloaded RAM. I remember one time my phone just stopped charging, I thought the charger had gone bad so I went to get a new one; that, and the others I borrowed from friends didn’t work until I restarted the phone. Some people that find themselves in this situation may even take the battery out and slam it a few times on the floor, then when the put it back in and it works, they’ll go “hey my trick worked, I’m a genius“. But in reality, a simply restart would do it. Press and hold the Sleep button on the top of your iPhone for a few seconds until the red slide to off slider appears. Slide the slider to turn off your phone. Wait about 10 seconds, then press the Sleep button to turn the phone back on. Now, re-open Netflix and try to do what you were trying to do before the error 1011 came up (streaming a movie perhaps). Like I said before, the problem could be your network connection. Have you tried opening a webpage from your browser to make sure your connection is good as described in item 1? If you have, it is also possible that your connection speed is not quick enough to stream videos on Netflix, so trying another internet connection (WiFi) would be your best bet to rule out your connection as the cause of the problem. Click on the Settings icon on your home screen. Find your Wi-Fi network and connect to it. After you have connected successfully, open Netflix and try streaming your video again, it should work this time. After typing that address and pressing enter, you netflix cookies would be cleared and you would be logged out of your account. Now try to log back in and see if the error remains. Press and hold the Netflix icon on your home screen until it wiggles. Click on the little X on the top of the icon, then choose Delete. Visit the Apple App Store, then search for Netflix (by Netflix Inc). The app is free. Click Install. After the app has installed, sign in and try to stream again. I have received the 1011 error yesterday and today. I have tried all of the above suggestions both yesterday and today. None of them work. Then try to sign in again.